The Department of Philosophy is pleased to announce that one of our alumni, Shelley Weinberg (PhD, 2008) is the winner of this year’s Journal of the History of Philosophy Book Prize. Weinberg is currently associate professor of philosophy at the University of Illinois. 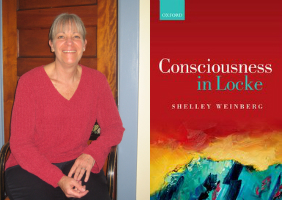 Prof. Weinberg’s winning book, Consciousness in Locke, was published by Oxford University Press and grew out of the work she did in her U of T dissertation, which was supervised by Donald Ainslie. Prof. Ainslie himself won the JHP Book Prize last year for his book Hume’s True Scepticism (Oxford University Press, 2015). (You can view a list of previous winners on the JHP website). This is a terrific achievement by one of our outstanding alumni. Congratulations, Prof. Weinberg!